Aurora Farms has all the Eggs for Spring and Easter you need. Visit our farm store on Schoolhouse road-Spring Special for eggs is $7.00 per dozen or $20.00 for a flat of 3 dozen. 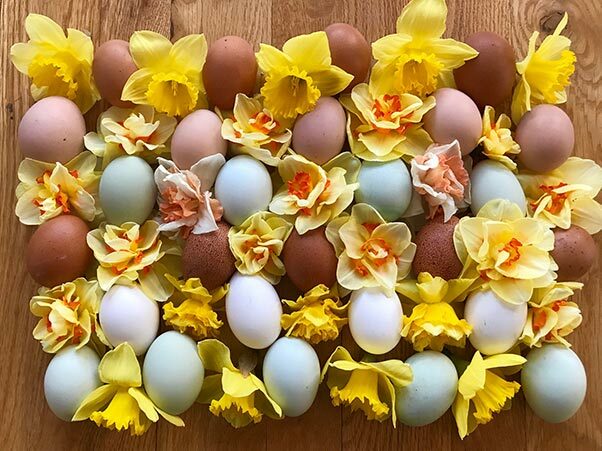 Our organic eggs are from healthy happy poultry that follow our livestock and eat all the bugs, worms, larvae insects and grass to give you those sweet neon yolk stand up in the pan eggs that you love! All our incredible veggies are available too; herbs and flowers! Check out our freezers for organic pastured award-winning pork, lamb, goat and beef, sausages and more. Open everyday 10-7 or by appointment.